It's already been three years since Godzilla made his return to the big screen in Gareth Edwards' 2014 take on the legendary Kaiju. Even though fan response to the movie was a bit mixed, the movie made a lot of money and paved the way for Godzilla 2. The King of Monsters is shooting, and will bring some more classic monsters into the fold. One of those monsters is Mothra and now a small tease to the monster's arrival in the Monsterverse has been revealed. In Kong: Skull Island it was established that the company Monarch is going to serve as the connective tissue between these Monsterverse movies. The official Monarch Sciences Twitter account recently released a photo that doesn't say Mothra by name, but the photo is very clearly alluding to the giant winged beast and the caption provided for the photo isn't exactly subtle. This is not the first tease to Mothra in Godzilla: King of Monsters, which was titled Godzilla: King of Monsters but it appears that the title may have been abandoned since. In a post-credits scene from Kong: Skull Island we see some of the folks at Monarch showed some historical evidence of Mothra, as well as Rodan and King Ghidorah. So we have had glimpses of the monsters that are going to be joining Godzilla on screen on March 22, 2019. 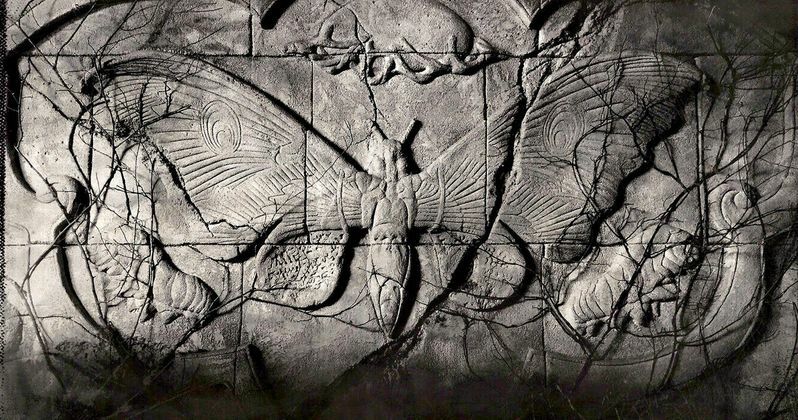 But this photo, which depicts a giant moth carved in stone with a couple of egg-shaped cocoons on either side, provides some pretty substantial proof that Mothra is going to show up in all her glory in Godzilla 2. Mothra took off once she started showing up on screen with the King of the Monsters in movies like Mothra vs. Godzilla and Destroy All Monsters back in the 60s. Mothra was a foe for Godzilla sometimes, but the two Kaiju also fairly regularly teamed up with one another, so it is possible that they could wind up ganging up on the three-headed King Ghidorah in Godzilla 2, which would be pretty fantastic to see. Especially considering that director Michael Dougherty has promised that there will be some practical monster effects in this movie and it won't all be CGI. In addition to adding some new monsters to the roster, Godzilla 2 has also brought in some great new human cast members like Millie Bobby Brown, Kyle Chandler, Vera Farmiga and Charles Dance, with Sally Hawkins and Ken Watanabe set to reprise their roles from the first Godzilla. It has taken a long time to get Godzilla 2 going, but it sounds and looks like this is going to be well worth the wait. Director Adam Wingard is really going to have his work cut out for him in trying to top this with Godzilla vs. Kong on May 22, 2020. Be sure to check out the new Mothra Monsterverse photo for yourself below.